GULAKI devotes to offer fashional, unique, useful, high-quality smart easy life electronic accessories. All we do is to make technology simpler and more enjoyable for customer. We provide each customer with the manufacturer warranty and superb customer service. Any question or advice, please feel free to contact GULAKI support. Universal car mount holder designed for iPhone 6, 6 Plus, 5S, Galaxy S6, S6 Edge, S5 and other Smartphones. Convenient design, choose to mount on the air vent. And it’s made with the highest quality ABS plastic. Non-Damage installation without suction cups,clips,screws, adhesives or glue etc. 360-degree rotation makes it easy to achieve the perfect mounting angle. Pull apart the spring holder to insert mobile devices and the padded grips will protect your device from scratches while securely holding it in place. We are so confident that you will love your new GULAKI Bicycle Phone Mount, that we have offered our hassle-free, 100% Money Back Guarantee with every purchase. If you are not satisfied with your order, we will issue you a full refund, no questions asked. 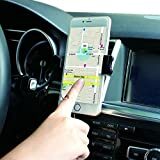 This car phone holder makes the perfect gift for anyone!